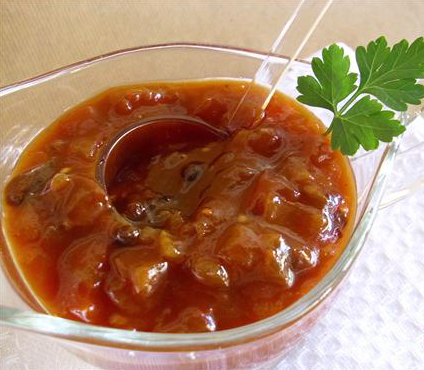 Monkeygland Sauce is a restaurant item in South Africa. The tangy sauce is prepared in several manners, and may include a blend of fruit and spices. It is typically served with meats, such as steak, hamburgers, pork ribs or chicken. Several popular South African fast-food chains serve a Monkeygland Burger. Despite the name, the sauce does not involve monkeys in any way. Instead, it is made up of chopped onion, garlic and ginger, with a combination of chutney, soy sauce, mustard, worcestershire sauce, ketchup, and wine. At the time the sauce was developed there was a lot of speculation in the popular medical press regarding the use of monkey glands as a means of keeping young. Recipe for Monkeygland Sauce see Here and Here.